Where were you at age 15 ½? I was a sophomore in our wonderful Catholic Central High School in Alpena, Michigan; Was very active in all school activities; never missed a school dance; Sang in our High School Glee Club and Parish Choir; Continued from childhood days to figure skate and be part of our annual Alpena Winter Carnivals; And I wanted to enter the convent to be a Sister! Now…where were you at 16 ½? I was a junior at Catholic Central; Enjoyed dating and still never missed a school dance; Active in School Plays, National Honor Society, Forensics, and all school activities; Worked as a soda jerk in one of our local drug stores; Had lots of friends; had wonderful sleepovers at each other’s homes; Was now driving; Still sang in both our High School Glee Club and Parish Choir; Still loved to figure skate and be part of the annual Alpena Winter Carnivals; But…the convent thought went completely out of my mind! Now…where were you at 17 ½? What made me think of religious life? What have you found in ministry? Ministry for me has been expressed and experienced through the gift of music: Having the privilege of receiving a Bachelor’s and Master’s degrees in Music Education; (Bachelor’s at Aquinas College in Grand Rapids, Michigan; Master’s at the University of Illinois in Champaign/Urbana, Illinois) Teaching music in K-12, and private lessons in piano and organ – in cities of Michigan and New Mexico; Doing administrative work at Aquinas College in the Registrar’s Office, Continuing Education, Human Resources and in our graduate program entitled The Aquinas Institute of Religious Studies. Being a founding member and director of our wonderful singing group, The Mellow D’s, who shared their gift of music and faith around the country for almost 25 years. On our Grand Rapids Dominican Leadership Team for four years. Working in the Marketing Dept. for a Music Publishing Company (World Library Publications); Now back at our Motherhouse as liturgical musician sharing life and music with our women, our Dominican Chapel Choir and Sunday Assembly. And…my life continues to be blest with additional opportunities and experiences because of the gifts with which God has blest me. I am SO grateful! I grew up in a home of inclusivity, of welcoming, of having an open mind and heart. My Dad was Methodist, and my Mom was Catholic – and all were welcomed at our table. Daily I hope I live out that simple prayer of years ago. “In my next life”….. I want to return as a great world and Olympic gold medal figure skater – who is a Grand Rapids Dominican! 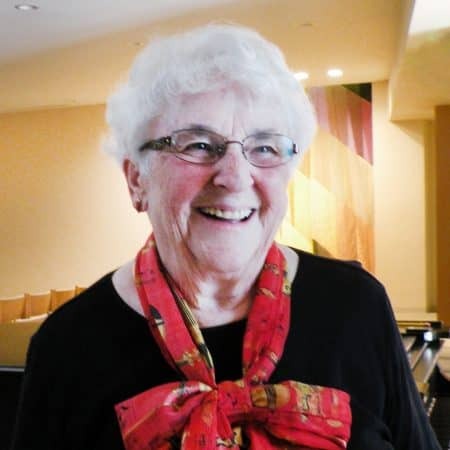 Sister Joan Thomas was a founding member and director of the wonderful singing group, The Mellow D’s, who shared their gift of music and faith around the country for almost 25 years.